For about a week, during my daily drive to and from work across 2012 Los Angeles, I was simultaneously transported to 1938 New York City via the audiobook of Amor Towles’ 2011 novel, Rules of Civility, as read by Rebecca Lowman. I’m still pretty new to audiobooks, and for the most part, I’ve enjoyed nonfiction audios more than fiction, but this novel was a joy to listen to. That’s partly because I’m a sucker for books set in not-so-old New York, but Towles’ protagonist Katey Kontent is an original, and they way Lowman gave voice to her story stuck in my head and actually made me eager for my commute. It takes something special to do that. Rules of Civility opens in 1966, when a woman unexpectedly spots a familiar face in the photos on display at an art opening and finds herself remembering 1938, the remarkable year when she knew its owner. At 25, Katey (originally Katya) Kontent (accent on the second syllable) had already made her way out of the Russian enclave of Brighton Beach, Brooklyn and into the secretarial pool of a Lower Manhattan law firm, and was getting to know her city better in the company of her roommate, Midwestern transplant Evelyn (originally Evie) Ross. When the girls crossed paths with Tinker (originally Theodore) Grey a few hours before the start of 1938 and they all share a New Year’s toast to “getting out of ruts,” they had no idea that the end of the year would find them all in very different places. Personal reinvention has long been part of the mythos of New York City, and it’s a primary theme of the novel; the title comes from a list of “instructions for living” that George Washington compiled for himself, and which serves as a personal guidebook for Tinker. 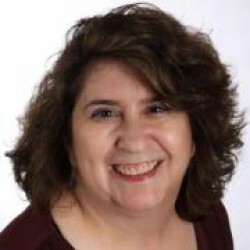 Eve and Tinker’s purposeful reinventions have effects and repercussions for Katey, shaping and redirecting her own less calculated self-making. 1938 is a year in which Katey experiences much of New York life for the first time, and she gets the opportunity to choose which aspects of it she wants to carry forward. She works hard and well, she’s wry and observant, she’s smart, independent, and open to taking calculated risks...and she never goes anywhere without a book. I don’t think she was created to be instantly lovable, but I found her thoroughly engaging and would have been happy to follow her story through decades, rather than just one year (although we do get an epilogue). But having said that, I rather hope there won’t be a sequel; as much as I adored Katey, I felt that Rules of Civility told the story it meant to tell in full, and told it well. 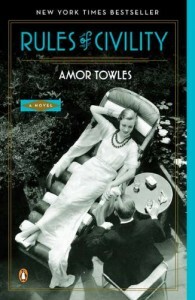 Like its protagonist, Amor Towles’ debut novel is assured, smart, and well-observed, and openly wears its mid-20th-century influences. Audiobooks can amplify weaknesses in writing, but aside from an over-reliance on similes, I didn’t find many here. Rebecca Lowman managed to give distinct voices to nearly every character, and her interpretation of Katey--and her city--sounded perfect to my ears. Rules of Civility is distinctly and proudly a New York story, with a distinctly, proudly New York cast of characters, and I was thoroughly immersed in its world.